You would not believe the fun you can have at tank museums. It was above the usual spot of a tank in the foyer of the Imperial War Museum that Wargaming CEO Victor Kislyi forlornly asked our Paul why schoolchildren were “not exposed to the beauty of tracked vehicles?”. And it was at the Polish Tank Museum that our Jules first saw a mother tank with her child. Perhaps you can enjoy similar escapades to the PCGamesN team at the Tank Museum in Bovington, Dorset, England. 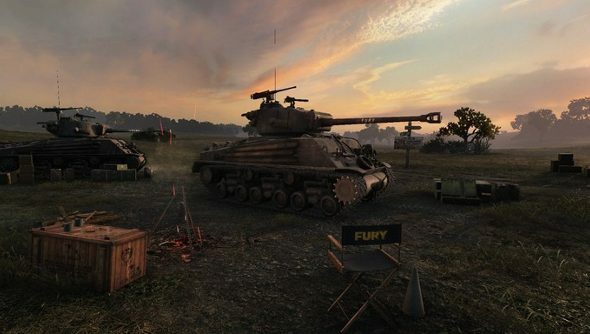 Wargaming are giving away a family ticket as part of a celebration of their new M4A3E8 Fury Sherman. The developers are offering five unlocks for the tank in World of Tank’s PC version, plus a garage slot and seven days of Premium. The ticket is the top prize, however, and will admit two adults and two children into the Fury exhibit at the museum. If the museum loaned you the tank, what would you do with it? Remember, tanks are versatile: you can even play football with them. Using secret algorithms, we’ll be picking the ones that fit our strict, top secret criteria. The codes will only be valid on the EU/NA server, and go live on October 20. Do you think you’ll go and see the new Brad Pitt film with the Fury in it? The cast’s bonding exercises sound absolutely doolally.